If you want to have a restaurant with a view in the City, you will probably find yourself going through metal detectors before a lift ride up to the top of one of the new office blocks. A relaxed and far more interesting alternative is to walk up a few steps (or take the five-second elevator ride) to the mezzanine floor of the Royal Exchange Building. This Grade I-listed building is the third on the site and dates from 1840. Today it’s an elegant dining and shopping district, with a ground floor housing everything from Jo Malone to Leica Cameras, L’Occitane to Smythson, as well as several watch boutiques (Bremont, Omega and Watches of Switzerland as well as the Watch Exchange), where bankers who’ve decided to upgrade (or recently lost their jobs) can trade in their timepieces. Take an international client here, and they will be impressed. 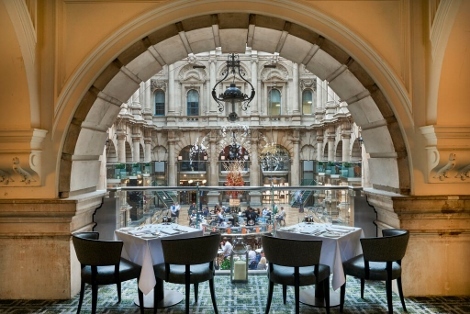 The Royal Exchange floor has several options for drinking and dining, all managed by D&D London, formerly named Conran Restaurants. 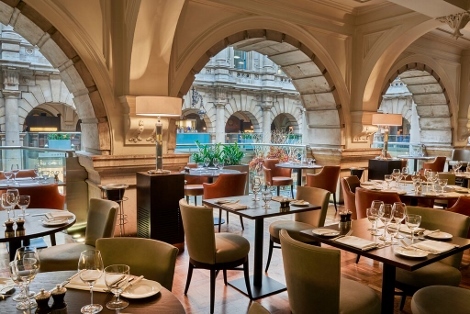 As well as the ground floor Grand Café, on the mezzanine floor there’s the Threadneedle Bar, which along with Sauterelle, the subject of this review, has recently been refurbished. The list of drinks is extensive, but this being a Friday lunchtime we settled for a simple glass of chilled Moet & Chandon (£12.50) and tried to remember the last time we’d been to the Royal Exchange (Christmas, several years before, and slightly worse for wear). For those of us who appreciate design by ignoring it, I can say it’s now a relaxing place (even on a Friday lunchtime) which has the benefit of both being inside protected from the British weather while any sunshine comes in from the high room of the Royal Exchange. It helps having movement and life across the ground floor and between the shops to give the place some animation. The menu is high-end Italian with a touch of French, under Executive chef Stefano Leone and head chef Piero Leone (not brothers, or even relatives, apparently) and changes seasonally. 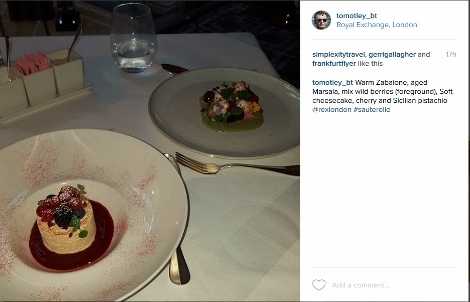 We ordered from the a la carte, though there’s a set menu for £28.50 for two courses, £35.50 for three courses. Our October menu featured (for instance) an Autumn Salad and butternut squash amongst the starters. The wine choice is very well selected, and again, constantly changing, with the sommelier willing to recommend bottles, but also wine by the glass for pairing with the dishes. We started with Wild shellfish salad and the Autumn Salad, and our mains were Gloucester old spot pork, pancetta, espelette chilli and pequillo pepper and Rhug Estate organic Aberdeen Angus beef fillet with roasted shallots, blue creamed potatoes and Barolo jus. The food was served with real attention to the presentation, and was delicious: delicate, with lots of subtle flavours and the wines suggested were spot on, though we were especially impressed that we were given tastes before deciding on each option. Also on our menu (but not tasted) were Native Oyster Carpaccio and Buffalo mozzarella served with Oscietra caviar and balsamic pearls, marinated Loch Var salmon, sea leaves and fish broth and Tortelli di Zucca Gialla. Desserts were unnecessary but a perfect end to the meal – the Zabaione was one of the loveliest I’ve tasted. 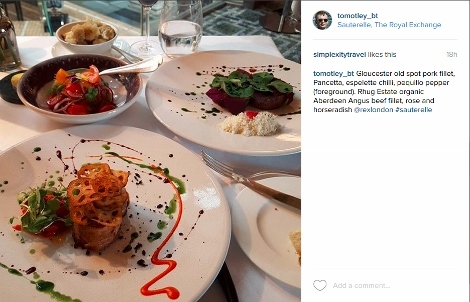 Excellent food, a fabulous venue, and top notch staff and service, friendly, informative but not overbearing.